Cyclone Megh formed hot on the heels of the late Cyclone Chapala, with the latter barely having time to fall apart before the former started to rev its engines. Megh came into existence very near to where Chapala developed, and it followed a similar, extremely rare path toward Socotra. Whereas Chapala’s eyewall grazed Socotra as it made a hard-right turn toward the populous Yemeni city of Al Mukalla, Megh made landfall on Socotra and continued toward the west. 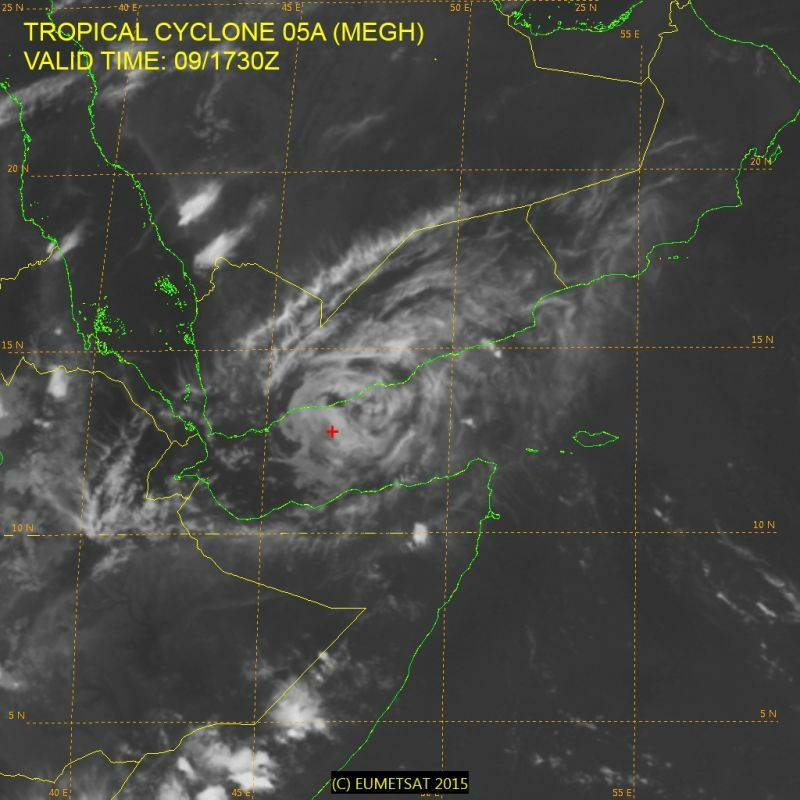 Megh is the second hurricane-strength cyclone to strike Yemen in the past week. If the fact that, until last week, no hurricane-strength storms had ever hit Yemen since reliable records began in the 20th century isn’t enough perspective, consider that a hurricane hasn’t made landfall in Florida since Wilma came ashore ten years ago last month. Thankfully, unlike Chapala, Cyclone Megh rapidly fell apart as it turned toward mainland Yemen, degenerating into little but some showers and clouds swirling into the Arabian Peninsula. However, Socotra wasn’t so lucky. Socotra serves as home to tens of thousands of people, most of whom live on the northern coast where Cyclone Megh made landfall on Sunday. The BBC reports that 18,000 people were displaced and hundreds of homes were destroyed when Chapala made landfall last week, and Megh made landfall an even stronger storm than the one that struck on November 3. The Arabian Sea sees several tropical cyclones every year—some of which reach hurricane strength—but it’s rare for them to make landfall stronger than a tropical storm or depression. Both Chapala and Megh took advantage of low wind shear, ample moisture, warm ocean waters, and favorable steering currents to take these rare and remarkably identical paths. Hurricane-strength tropical cyclones rarely make landfall on the Arabian Peninsula due to the very dry desert air that usually chokes storms before they can reach land. Only a couple of these cyclones have come ashore on the Arabian Peninsula since reliable records began in the 20th century—Cyclones Gonu (2007), Phet (2010), and Chapala (last week) are the only storms to strike there in recent history with winds equivalent to those found in a hurricane. Gonu and Phet both made landfall on the far eastern tip of neighboring Oman. Socotra taking two strikes from two different cyclones in one week is an impressive and unprecedented feat just by virtue of the island’s tiny size, let alone the region’s tropical cyclone climatology. Socotra is only about 1,500 square miles in size—just a little bigger than Rhode Island—and it has a relatively arid climate, only seeing about ten inches of rain in a normal year, which is roughly on par with San Diego, California. The odds of one cyclone striking this tiny point in a vast, normally arid region of the world are pretty small, and the odds of two such cyclones achieving this feat are astronomical. Before this month, the last storm to make a direct landfall on Socotra was an unnamed storm known as “12A” back in October 1972 (track map shown above), which weakened to a tropical storm before making landfall close to where Megh came ashore on Sunday.